When it comes 2 luxury watches also come from luxury company, beside on the cost or price which is will so highly expensive for us, the performance, design, or features offered are often making confused then, it will appear question about which one is better or which one I should buy? In those problems, we give you a hand through writing the article in form of verses. 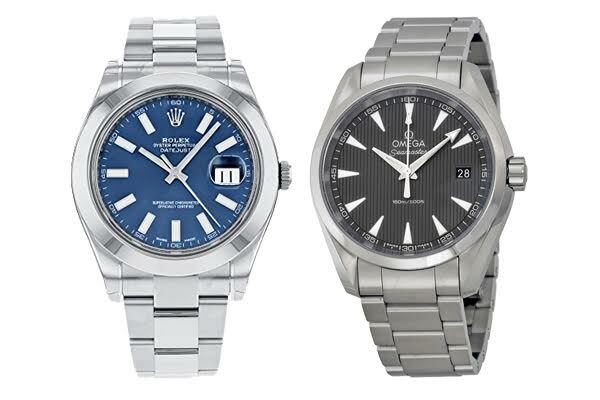 The title will be Rolex Datejust II vs Omega Aqua Terra. Yap! Rolex and Omega, they are successfully surprising us when the upcoming product is just released. But, for now lets we enjoy Rolex Datejust II and Omega Aqua Terra first. Both of the watches have ample water resistance for activities such as swimming, snorkeling or even showering, but still not in hot water. The Rolex Datejust II has a water resistance of 100m/330ft while The Omega Aqua Terra has a water resistance of 150m/500ft. And the Rolex Datejust II is only available in stainless steel although that could change, different with the Omega Aqua Terra which has several good materials including stainless steel and yellow or rose gold. If you wear Rolex Datejust II, you can feel stainless steel bracelet around your hand, but if you wear Omega Aqua Terra, you will feel the sensation of fabric straps and leather straps as well as stainless steel and gold bracelets. The performance of both watches can be seen in the movements on each watch. The Rolex watch movements with a 39 mm watch (larger watch at 42mm) arrive back from COSC with a COSC certified chronometer designation, Rolex places the calibers in the case and conduct further in-house testing and only release the watch with a Superlative Chronometer designation when the watch proves to be precise to -2 or +2 seconds per day accuracy. The Omega Aqua Terra with a 41.5mm watch (actual size is 30mm, 34mm, and 38.5mm) is a COSC certified chronometer, the highest designation that a watch can get from the Official Swiss Chronometric Testing Institute known as COSC (Contrôle Officiel Suisse des Chronometres). The accuracy of a COSC certified chronometer is a standard 99.99% accuracy or -4 to +6 seconds per day. Selling the brand of Rolex is actually not enough to get better watches. Because, we have already paid with high price, we hope that it equips with precious materials and great performances, isn’t it? But, Rolex Datejust II is lost when we do comparison with Omega Aqua Terra whether it is from the material and the performances. Purchasing Omega Aqua Terra is better, we are highly recommending you that.